The use of satellites for information about the weather has become common place as many people use the rainfall radar to know if rain is coming. In remote areas satellite derived information becomes increasingly important for several disciplines among which are land use and water management. For our work in West Africa, we use satellite derived rainfall estimates to calculate the cumulative rainfall in the upper basin of the Niger river. Since rainfall data have been collected for a long time (since 2001 with satellites), the actual rainfall estimates can be compared with the historic data set, setting the present data in perspective. 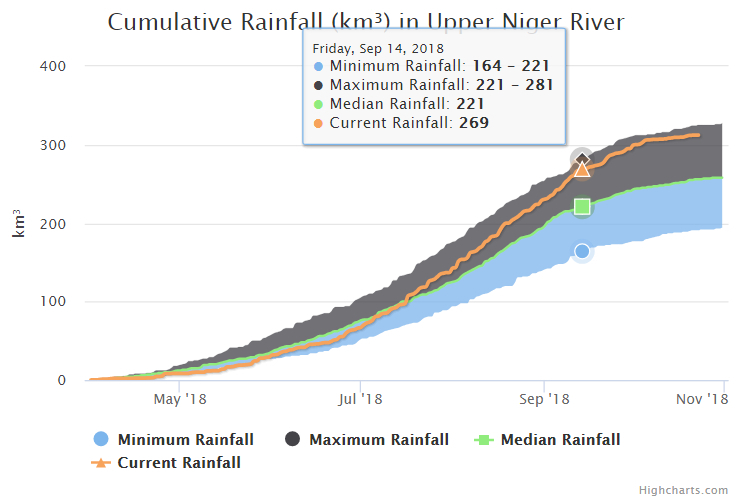 As an example you see in the graph below the cumulative rainfall in the Upper Niger Basin in 2018, which was very high compared with the recent past. This type of information is used to estimate the river discharge and the possible flooding of the flood plain downstream. Altenburg & Wymenga, together with Wetlands International, developed a prediction model of the height of the annual flood peak in the Inner Niger Delta in Mali. The forecast model is used by th..